1) Old copper mine pit with new excavation underway. Very large! (see http://www.bravenewleaf.com/photos/uncategorized/2008/03/24/copper_mine.jpg) Small pool of water at the bottom. Mining equipment strewn about. 2) Slave tent city. Approximately 400 people crammed in together. Surrounded by ten-foot high razor wire fence. 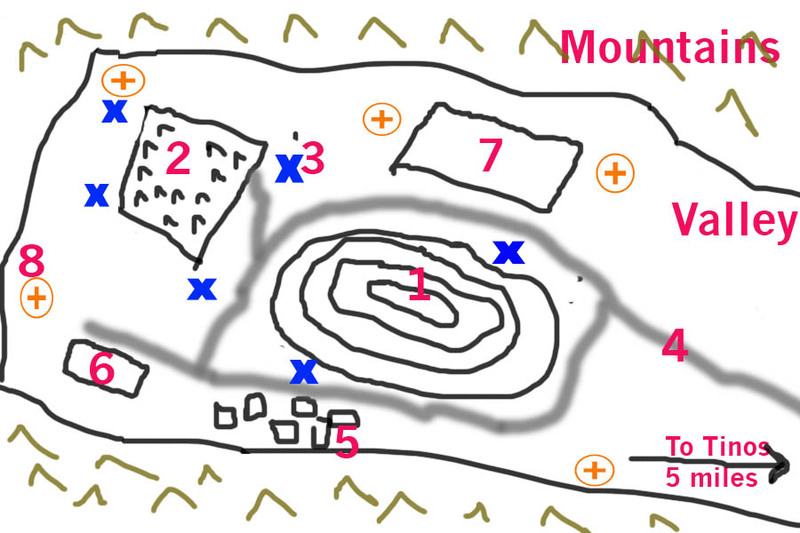 3) Blue X's represent watchtowers manned by Centurions with heavy machineguns. 4) Dirt roads around the camp, linking up with a dilapidated asphalt one leading to Tinos in the east. 5) Storage bins and shacks. 6) Large building. Unknown purpose. Humans seen going in and out - some come out dead. 7) Pounded out strip of land that appears to be their airfield. 8) Orange O's with crosses represent surface to air missile batteries. Enemy strength estimated at about 40 Centurions. 1 on each tower and SAM battery (total of 12), 10 on random patrol around the perimeter, and the other 18 herding humans, standing guard, etc. There is normally one heavy raider there at all times, and another 1 or 2 that come and go. The nearest real airbase Kharon knows about is in Glenhaven, 100 miles to the NW. This gives them about an 8-minute response time to Tinos.